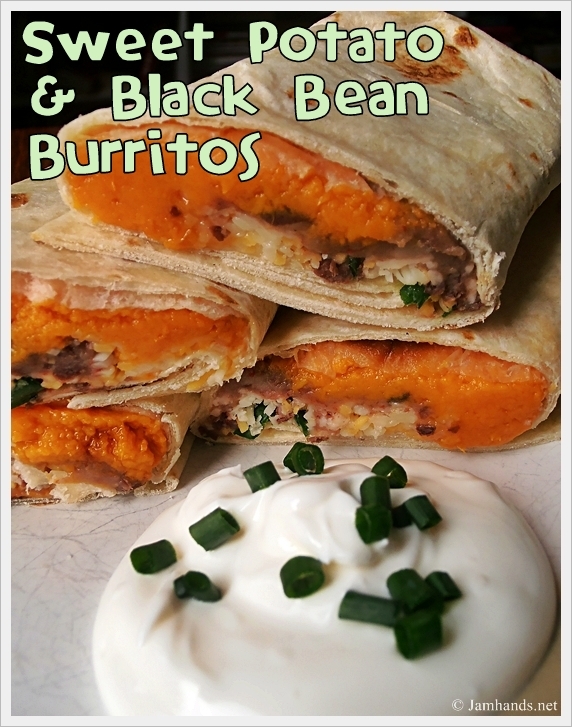 If you have not had the pleasure of eating a sweet potato & black bean burrito, the time is now folks! I love making freezer burritos just for the fact that you can spend one session of time quickly preparing them, then store them in the fridge or freezer and they are ready to grab when you are rushing through the week. The spices I have included to add to the bean mixture are just a guide. Whatever sounds good to you, use it! I would just recommend that you taste the two components of the sweet potatoes and the bean mixture to check for any needed seasonings before you assemble the wrap. Ready for the recipe? 1. Cook sweet potatoes until soft using your preferred method. (I usually bake them in the oven). Remove skins and mash until smooth. Season with salt. 2. In a food processor, combine the black beans, onions and spices. Process until desired consistency. 3. Add all ingredients except sour cream to tortilla. Wrap and freeze if desired. To freeze: Wrap burritos individually in foil. Store in a Ziploc freezer bag. To reheat, remove foil and wrap in a paper towel and microwave for about 1-2 minutes until heated through. Serve with sour cream. Thank you Keros :) I hope you enjoy it! I am glad that you are posting again. You always have great recipies -- the kind that I would make. Thakn you! !